Some of my goals for this blog are to be open and honest and to also have some fun and hopefully make you laugh. I also want to show you that I’m not perfect! As bloggers and with so many social media options, we have a tendency to put our best foot forward and only show you the good stuff. No one is perfect and I’m far from it. I’m taking you back to when I was 17 years old as a teenager with an extremely overactive imagination. Over the summer I had gone somewhere in the morning and was returning to my house in the afternoon. When I first turned onto our road, I saw a police car pulling out. I didn’t think much of it because the entrance to our road was hidden and cops used to park there to catch speeders. But as I made my way up the hill, I noticed that there were TONS of police cars across the street at our neighbors’ house. This didn’t sit well with me and as my luck would have it, my whole family was out doing other things so I was coming home by myself. Instead of going inside, I walked over to my neighbors’ driveway and was greeted by a cop. He told me that a man had escaped from the Bedford County jail which was about 20 minutes away from us and he had been spotted in my neighbors’ back yard. Ok, my 17 year old self was freaking out at this point. The nice cop offered to walk me back to my house and check all of our entrances to make sure I was safe. After the search through my house (and I must add I stayed right on top of the man, I certainly didn’t want to walk through my house alone! ), he confirmed that everything was fine, that all entrances were secure. He told me that the man was wearing an orange jumpsuit and if I saw anything to call 911. Once he left, I felt fine and pretty safe. Plus it was almost 1 p.m., time for Days of Our Lives, I had to catch up on my soap opera! Priorities y'all. While I was home alone, another neighbor called to check on me. She told me that she had a baseball bat with her in case anyone came into the house. I told her that I was fine, but I’d let her know if I needed anything and immediately went back to watching Days. …or should I say I saw him. Over on the right side wall I saw someone in an orange jumpsuit pressed up against the wall not moving. He must have heard me walk down the hall and approach the door, because he was standing very still. I didn’t waste a second, I quickly ran to the phone, dialed 911 and told them that the man who had escaped from the Bedford County jail was in our garage and I was home alone! I must tell you, those were the longest few minutes of my life waiting on the police to arrive. I stood beside the front door, heart pounding out of my chest praying they would arrive soon. Luckily they did and they brought a lot of backup. They even brought police dogs with them! I immediately opened the door and let three police officers into the house. I pointed to where the garage was and followed them over to the door. The three of them all pulled out their guns, assumed the stance you see on tv and pulled the door open. I was so scared!!! They walked all through the garage and even looked in my car to see if anyone was in there, but they found nothing. This of course scared me even more because I thought he probably left the garage and might be lurking around behind the house. Well, the cops couldn’t find anything, but on the way back into the house one of the cops noticed that a reddish/orange jacket was hanging on the coat rack to the right of the door. He so politely pulled it down and placed in on the deep freezer inside the garage. And that ladies and gentlemen is the story of how I got the crap scared out of me by one red jacket! Everyone was so nice and didn’t say a word about what an idiot I was, but I’m sure they laughed the entire way back to the police station about this young girl being scared to go into her garage because of a jacket! See I’m sure not perfect! But this story just makes me laugh remembering my innocence. I hope you enjoyed it and be sure to watch out for any errant red jackets that cross your path. To answer the question from today’s title, no this post doesn’t really relate to Pretty Little Liars, except for the whole red coat thing. I CANNOT wait for the summer season to begin next week; I’m totally excited about it. 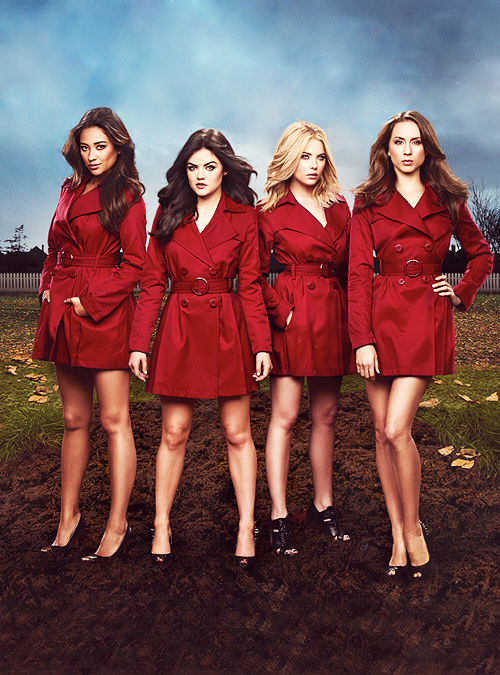 So there you have it, I somehow added Pretty Little Liars into a totally random blog post. Score for me! this is hilarious, and something I would totally do now! OMg that is too funny! Also I was in the colorguard too! Hahaha! OMG! I was scared for you for a sec.... and love the PLL pic...I am addicted to that silly show! Oh my gosh that story was incredible!!! I probably would have thought and done the same thing.